I was told you can usually predict your Stanchart (usually held in October) time by deducting 10 minutes from your Ndakaini (usually held in September) time, if you keep training well between the two runs. However, this time Stanchart had a new, tougher route. My friend George and I have been taunting each other about Stanchart (and other races). Ok I have been doing most of the taunting and he has been declaring he will be ready to give me a challenge. He is a nice, non-combative guy like that. (I am not sure if 2 and 3 above were separate). The bet was one-sided in that I was not to pay anything regardless of my performance or his. I told you he was a nice guy. At first, I was fairly confident that I would beat George, then he took a week or two to prepare for this final showdown and kept posting reports of hour-long runs that he had done. I started getting concerned. Meanwhile, friend of mine, a lady, was also preparing for her first half-marathon and she completed a 21km run/walk in 2.5 hours! My sister told me that her best half-marathon time was 2:19. Her time that I had been aware of was 2 hours 30 minutes, and that had been my target time. So here I was, I wanted to beat George, win some money, avoid being too badly beaten by a first-time lady half-marathoner, run as fast as my elder sister or at least reach my target time. I think I went to bed around midnight. I set my alarm for 5:50 a.m., so I was supposed to get about 6 hours of sleep. A little less than ideal, but not too bad. I had gone for a run on Thursday (which I was supposed to have done on Wednesday) and I could feel the effects of that run on my legs a little bit. I hoped things would be fine by race time. I woke up a few minutes past 5:00 and maybe once before. I tried to go back to sleep and I think I slept a little, and woke up again a minute or so before the alarm, so I waited for the alarm to start the I pressed Ok before it made a sound and woke up our son. I wanted to sew the hole in the past-knee-length shorts I normally run in, but the hole was a bit too big. And I did not find a needle and thread anyway. I put on other shorts. I also did not see my headband. Yeah, I know, prepare these things the night before. I woke my wife up and she made me a big bowl of oats. She kept insisting that I pin on my race number, lest I end up trying to pin it after the race has started. it drops, etc. She drove me near Nyayo Stadium. I took the oats as she drove. Do I not have a great, supportive wife? I was a bit concerned that I may have to pee during the run. I got out of the car at 7:07 a.m. by my phone and started moving towards the assembly area, stopping to pin my bib. I actually jogged a bit, partly because of the time, and partly to warm up. It was cold. I did not see George. The official clock seemed to be ahead of mine, because the countdown to the start started when my phone was saying 7:23 a.m., I think. The countdown was stopped, as apparently some people had started before the gun went off. Some orders to runners to move back and so on, a much shorter countdown and we were off. 7:27. I started my timer. The expected crowding at the beginning but the crowds thinned out. I thought there were very many Indians running. There were also small children. I thought the race was for 18 and over? (I checked later and yes the rules say you must be over 18). I had a plan and had set my interval timer (I will write about it soon) accordingly. Run 20 minutes, walk for 2 minutes, repeat 7 times. That would be about 153 minutes. I also did not want to hold back as much as Jack pointed out that I did at Ndakaini. As usual, there were all sorts of people running. There was an Indian lady in a full sari, another lady in a jeans skirt that was about ankle-length and a man running with and leading a blind runner by the hand. There was also a group of apparent Gor Mahia (a football club) fans singing as they ran. It would probably be fun to run and sing with them, but would definitely be slow for me. I was just behind a tall white dude during most of my first run interval. When I stopped to walk, he ran on ahead. I think I only saw him once thereafter. There was a boy who looked Chinese or Korean or something close. I saw a dreadlocked guy with red headphones. The route had several turning points, as you approached each turning point, you could see those who had already passed the turning point running in the direction opposite yours. I looked out for a few minutes for Jack as we approached the first turning point, which was on Haile Selassie Avenue. I did not see him and I decided to stop craning my neck. Soon after we entered Kenyatta Avenue (or was it Harambee Avenue? ), I saw what looked like the leaders in the race running in the opposite direction. Oh, I thought, I am not that far behind the leaders. Then I realised that it was not that simple. We had to run along Kenyatta Avenue, turn, run back up, then turn into Koinange Street, turn, run back and rejoin Kenyatta Avenue. So the leading pack was quite some distance ahead of me. Sigh! The weather was great! Cloudy and cool. I approached the first water-point and I grabbed a bottle. I put my phone in my pocket and opened the bottle. I was about 12 minutes into my second run interval. I took the water and poured some on my head. I usually don’t do that. I think I did it coz I see people doing it. Some water sprinkled on my bib, which has the timing chip. I feared that the water might damage the chip and my time would be unrecorded. Then I thought the foam around the chip must be to protect it from such things. Oh well. I cast the bottle aside (near a collection point, I think?) and fished out my phone. Damn! The timer had stopped. I pressed this and that to reset it such that it would start from around the time I had covered so far, but it was no longer the same. There was a lady in uniform standing at the corner of Kenyatta Avenue. Maybe National Youth Service. She was rather curvy. I found that unusual for a lady in uniform. She was pretty too. As I approached the turning point at University way, I thought, If I saw George on the other side, I would feel pretty discouraged. I ran on. Then I heard someone call me from the other side. It was George! I was near enough the turning for me to speed up and catch up with him. He said he had seen me earlier. He had seen me walking and felt very happy. Then he had seen me taking water as well and making calls. I told him that walking and taking water are not bad for me (as they are for him. He says if he does either he is usually unable to run any more). I explained about my timer and subsequent fumbling with the phone. He gave some response or other and I left him. There was the dreadlocked guy with red headphones again, already heading back towards town. At the ascent at Museum Hill, I ran up a bit then thought ‘This is not training, no need to wear myself out.’ So I walked up a bit. Along Forest Road, we reached a stretch that had only a tape separating the runners moving in opposite directions. There was a girl walking along this tape and looking behind occasionally. She was moving in the direction of the next turning point. I thought she was going to cross over the tape and join the people who were running back. And she did. I saw a guy walking barefoot, carrying his shoes in his hands. I wanted to ask him why, but I did not want to seem concerned when I was not going to help him. Plus I tend to avoid starting conversations with strangers. Another water point was situated near the 12km mark (there was a sign) and I took some more water. There were also portable loos, but I was fine. “You can poop here, madam!” someone shouted. There was a turning point just after the water point. Ahead of me, I saw a lady and a man walking on our side of the tape, but heading towards the turning point. I thought they should be told to walk on their side. Then the lady just turned and started moving in the same direction as us. Cheat. I saw George a few minutes later, heading towards the turning point. We acknowledged each other. As I began crossing the flyover at Museum Hill, the Gor Mahia group was beginning the Hill’s ascent, still singing. I tried to estimate the distance covered so far. I was feeling pretty good. No aches or pains or anything like that. I figured we had maybe covered 2 km from the 12km mark then I saw a sign that confirmed my estimation. “We are almost done” he said. “The distance remaining is half the distance you have covered,” I said. We ran on. I stopped to walk. I resumed running and a short distance ahead, I passed him as he walked. I did not strictly follow my plan, but I was conscious of the times I walked and limited the duration of those walking sessions. A few times I resisted the temptation to walk. This was the real deal, not a training session where I could pause the timer to catch my breath. The official clock was running relentlessly. So I kept moving. The route took us through Uhuru Park, where sat a group of uniformed women singing a hymn, I think, rather beautifully. Up Kenyatta Avenue and onto Lower Hill Road. Lower Hill Road had a gentle but long ascent. I think I walked most of it. Another water point. I almost did not take the water, then I thought there may be no more water till the finish and I may regret not taking it here, so I took some. A City Clock stood near or at Bunyala Road. The time as I passed was around 9:17 a.m. 2 hours had not passed. I stood a good chance of me meeting my target time, at least. Up Aerodrome Road to yet another turning point. I decided to run the entire distance from that turning point to the next. I guy in front of me stopped running and started walking. “Let’s go! Let’s go!” I told him. He (I think it was him) caught up with me and we ran a while, then he gave up again. I ran on. I saw the girl who had crossed the tape at Forest Road. I saw a sign saying 20km and said to myself Surely I can run the entire last kilometre. At the entrance of the stadium stood a car with a timer in top. It said 2:38. Really?? That cannot be. I felt a bit disheartened. I entered the stadium. The public address system had music playing that reminded me of those scenes in movies where the silhouette of a weary soldier carrying a gun can be seen against an evening or morning sky following a great battle. It was nice, actually. I ran the final lap, onto the finish mat and exited my timer so that I could see the time. 9:39. 2hrs 12 minutes. Maybe the timer on the car had said 2:08 not 2:38. I guess we will have to wait for the official results. George later pointed out that maybe it was timing the full marathon, which indeed started 30 minutes before the half-marathon. I gave in the slip with my name (for what purpose?) and collected my medal (you did not need to give in anything to collect it). There was no free Lucozade, but there was free water. I saw Philip, who had earlier told me he hoped to finish in maybe 1:50. He did not know how long he had taken since he had no watch. He had also been thrown off by the timer on the car. We asked a lady to take photos of us with my phone. I met my former classmate Juma, who said he had taken about 1:40. I went to a stand where you could do an eye test – the ones where you read letters of the alphabet of increasingly smaller size. I could read them. (There was one letter I was not sure was D or G or something) I called my wife and told her how I had done (in the run, that is). I walked about the stands for a while, looked people I knew, with little success. I went home feeling pretty good. 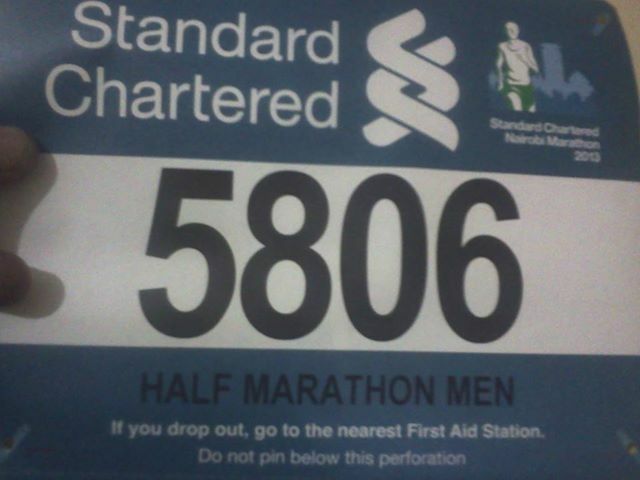 I had slashed more than 35 minutes from my StanChart 2012 time and 28 minutes from my Ndakaini time. 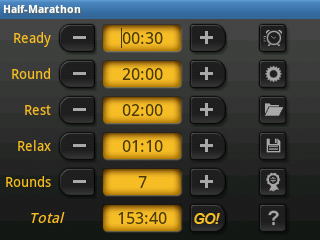 I had also almost certainly beaten George and surpassed my target time by 18 minutes. But let’s wait for the official times. I still don’t know how the first-time lady did.